The friendly staff at SC Internal Medicine Associates and Rehabilitation, LLC welcomes your call and looks forward to serving you. If you have any questions about our medical services, please call our office at (803) 749-1111. To schedule an appointment, you can call or use our secure online appointment request form. We are conveniently located within the town of Irmo right off of St. Andrews Road. In the event of a life-threatening medical emergency, call emergency medical services at 911 immediately. DO NOT WAIT! Inform the emergency room staff that you are a patient of SC Internal Medicine Associates and Rehabilitation, and they will contact us. If you have an urgent medical need and need to talk to one of our providers on call after our regular hours, please call our office at (803) 749-1111. A provider is on-call 24 hours a day. Your call will be returned promptly. 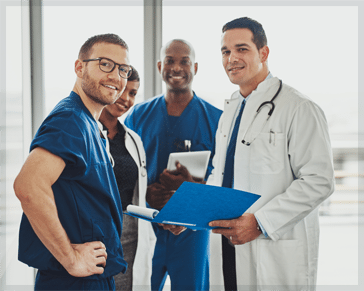 At SC Internal Medicine Associates and Rehabilitation, LLC, we accept workers’ compensation, Medicare, and most major insurance plans. Please contact your insurance company to find out if we accept your plan. If your insurance plan requires you to pay a co-payment, co-insurance, and/or a deductible, you will need to pay at the time of your visit. For your convenience we accept cash, checks, Visa, MasterCard, Discover, and American Express. If you have a question related to your bill or insurance, please contact our billing specialists at (866) 410-1507. If you are referred for one of our specialty services, and your insurance is an HMO/managed care plan and you are required to obtain a referral from your primary care physician, the referral must be obtained before you can be seen for an office visit. Please coordinate this with your primary care physician in advance. Appointments will be rescheduled if required referrals are not received in the office by the time of your visit. SC Internal Medicine Associates and Rehabilitation, LLC will accept an initial referral by fax, by phone, or by email from your provider, and we will obtain the needed signed prescription within days of your referral, or you may bring the signed referral form with you to our office. Prescriptions and refills for established patients of SC Internal Medicine Associates and Rehabilitation, LLC are routinely issued during our regular office hours (see above). Please call our office at (803) 749-1111 to schedule an appointment for your refill. We are conveniently located off of St. Andrews Road in Irmo. No refills are issued during the evenings, weekends, or holidays.